Survival Doctor James Hubbard, MD has written a new book, Living Ready Pocket Manual – First Aid: Fundamentals for Survival. In high stress situations, you don’t need a lot of complex explanations and jargon that will only confuse you. This books gives an average person exactly what’s needed to take action and follow through. There is also a section on what to include in a first aid kit some of which I found lacking in my own kit. Dr. Hubbard also reminds us to keep additional water for first aid purposes such as cleaning wounds. There is also a section detailing what types of antibiotics target certain illnesses. You never know when you’ll find yourself as a first responder in a disaster. The book is well-organized which makes it easy for someone to use in an emergency. It is small enough to keep in a bug out bag, or a hiking backpack. 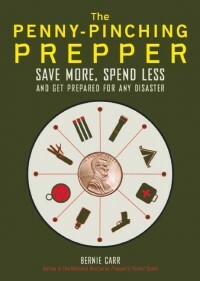 I think this book would also make a great gift for non-prepper recipients. I am sure by now you’ve concluded I highly recommend Living Ready Pocket Manual. For additional reviews of Living Ready Pocket Manual, click here. One winner will be chosen to win a copy of Living Ready Pocket Manual. Describe a first aid emergency that you’ve experienced. The winner* will be chosen at a random “Pick a Giveaway Winner” drawing on Saturday, January 18th at 8 pm Central. *Winner will be notified via email. Winner must reply to email notification within 48 hours or another winner will be drawn. When I was in college, I had an acquaintance who thought he could juggle his overly large knife…but found out he couldn’t, succeeding only in putting it through the middle of his hand. I got pressure on his wound, then tried to elicit help from several other students to get him to the hospital (we were on campus, the hospital was within easy walking distance), but every one of them slammed their doors as soon as they saw the blood! When I was younger and working in a factory, a co-worker got a finger cut off in a machine. We supported him physically, got ice on the remaining finger and wrapped it up. We got the finger off the floor and put it in a bucket with ice. The manager and another person drove him to the hospital. It was a stressful situation. My baby son fell and hit his mouth on the sharp corner of a table. Thankfully we were able to stay calm, because there was a lot of blood. Thanks for doing this giveaway. I’m usually the one getting first aid.lol But as a parent it is always frightening the things children put us through. My biggest scare was when my 3 year old jumped off his bed…..face first into the corner of the metal window! Luckily I have had some first aid training but it was a heart jumper. Head wounds bleed so bad it looked worse then it was. a co-worker slipped on wet curb, hitting his head first on a car bumper and the ground when he landed. we called 911 and kept him still until help arrived. we weren’t sure if he had hurt his neck in the fall. we held an umbrella over him to keep him dry and kept him talking. turned out good — no neck injuries or concussion, just scrapes & a bump. When I was eleven I was staying home from school on account of it was Presidents Day. Both of my parents worked and the only other person that was home with me was my older brother. I was playing outside with my dog (who wasn’t allowed to go inside) and decided to throw the ball in one direction and run the opposite way into the house because she was a big, strong dog and would always try to push past me to go inside. As I ran up the three or four steps I tripped on one and fell into the glass door (not a sliding door, but a regular door with four panes of glass) and lacerated my arm millimeters from the brachial artery. I saw my elbow was drooling blood, but I didn’t have any idea how bad it was. As I was going into shock my brother came running up. I could see by the look on his face that it wasn’t pretty. He instantly grabbed my arm above the laceration with what can only be described as a ‘death grip’ and didn’t let go until the paramedics arrived. If it wasn’t for him I probably would have bled to death. It was because of this experience that I started educating myself in first aid. You never know what may happen, so it’s best to prepare for as best you can. I live just south if Wichita is..daily we watch for tornados. (yes..they happen in winter too) I have personally been a first responder by chance not by choice. It would have been handy to have had Dr.Hubbards book. My new motto is be prepared not scared. Two years ago my young son tripped over the cord tying down our inflateable Christmas decorations and broke his arm. We used one of my daughters scarves as a makeshift sling until we got to the hospital. I was at a park with my daycare kids. The park was newly built and across town from my home. One of the kids slipped and hit his head. He split open a 5 inch long spot along his hairline. It was pouring out blood like head wounds do. It looked like a faucet was turned on low. I had a first aid kit with me but after popping it open I found that I had nothing large enough for that size of cut. He clearly needed stitches but I also needed to slow the blood flow. We managed to figure out a quick fix and get to urgent care where we met his mom. He ended up with 14 stitches. I had 2 big things I learned from this. I was not as prepared as I thought and stuff really does happen any time. Several years ago, I tried to swallow a too-large piece of pot roast that lodged in the back of my throat. It didn’t quite go down, so I tried swallowing again…and quickly realized I couldn’t breathe! I couldn’t get any air in, I couldn’t make any sound and the food was not coming back up. The scariest part of this situation for me was the realization that I was home alone. I knew my wife could have easily done a Heimlich maneuver for me, but there was nobody to help. Strangely, while I had a surge of panic when first knowing I was choking, I suddenly became mentally detached from what my body was feeling after I realized there was no help coming. I knew it was doubtful I could do a Heimlich on myself, so I adapted the method for helping a choking baby. I grabbed a can of soup from the cabinet, knelt facing backwards over my couch and stood the soup can on the couch’s frame back. Then I leaned over the can so it pressed up into the same spot where a person’s fists are placed for the Heimlich, and leaned further over the back of the couch so my face was nearly down on the floor. This position had me on my knees, hips against the cushion back of the couch and my solar plexus on top of the soup can and the bottom of the can sitting on the wooden frame along the back of my couch. The can was wedged between theframe and my body. My upper body was sort of inverted down toward the floor. Using my arms to push up slightly on the floor, I then let go of all my weight so my upper body quickly dropped down toward the floor and the soup can’s end was driven up under my sternum. It didn’t work at first and it hurt like hell in my gut. I tried three more times while trying to cough as hard as I could just as the soup can pushed into my solar plexus area and it worked! I spewed the meat back up and a lot of stomach reflux, saliva and snot out of my mouth and nose. It was a disgusting mess, but I could breathe again. The key to making it work was something that could push up into my diaphragm (increase my exhaling air pressure), finding a way to forcefully make it go in (my dropping body weight and gravity against the couch frame), and being inverted to let the food ‘fall’ back out of my throat (pulled by gravity and pushed by air pressure). Sorry for the rambling, but this is a true story. After it was all over, my panic came back and I ended up in shaking exhaustion on the floor for about 10 minutes with the realization that I could have died. My chest hurt for a couple days and I had a round bruise that matched the circular top of the can. This happened about 4 years ago, but I still have occasional nightmares where I wake up from the feeling I had when I couldn’t breathe. When I was in high school I went on a student exchange overseas with 5 other teenagers. We had a 7 hour layover, and right before we were about to catch our flight, another girl passed out and had a seizure. Fortunately there was plenty of help around and I ended up staying with her in the hospital overnight (In a country where I didn’t know the language) and flying on the next day. She was fine but it was a very scary experience. It happened to me a month ago……my sister sent me a package in the mail, with fun stuff she found for me. When she sends stuff, she seals those packages with so much clear tape, a nuclear explosion wouldn’t even touch it. So upon getting it in my house after doing my dance of joy to the UPS man at the door, I went into the kitchen and grabbed scissors. Hubby just walks in from working and sees my excitement opening my box full of goodies, and as I am taking the scissors and cutting toward myself, my hubby is just about ready to say, ” are you f- ing crazy” ? It happens. “STAB” right into my left forearm. I immediately dropped the scissors, grabbed my arm, and ran for the kitchen with hubby right behind me. Turning on the water in the sink, I thought, it’s just gonna be a little blood. Ohhhh nooooo. As soon as I took my hand off my arm, it was pumping full force with every heart beat. I cut a major artery! Holy crap. Had I been alone I don’t know what I would have done! I was in a panic! Then there was my husband, trying to keep me calm. He told me to put pressure on it and he ran upstairs for the medical kit we bought from Costco, that has everything you could ever need in an emergency! It took 3-4 attempts to put on a butterfly bandage because of the heavy bleeding, and at one time I thought I was heading toward the floor from fainting…..but he finally did it. During the day, he would check on my arm and change the bandage out when the open wound was finally stuck together enough where blood wasn’t pumping out of my arm. Putting on antibiotics and keeping it dry and clean, one week later, It was pretty healed. I have a scar now but I am happy to say, I didn’t need to go get an expensive hospital bill because my husband, who I now call “Dr. Dan” saved my life. He’s been in construction for over 35 years, so he has seen and done lots of fix ups for guys on the job. last year I took my two boys camping and my 11-year-old wanted to chop wood. the only thing we had was an entrenching tool with a serrated edge. Well after the tenth or eleventh chop, he began chopping sloppy and as he reared back, he brought the tool right into the middle of his skull. He dropped the tool, and looked up at me with a dazed look. I rushed over to him as I saw a giant bead of blood began to fall from his head. I took my shirt off and gave it to him, so was not sure what else to do. I told him to keep pressure on it and rushed him to the emergency room. They told me that I did good to have him apply pressure but it was bad to use a dirty shirt, as this could cause an infection. I would have loved to have this book to refer to. This past June I was diagnosed with MS losing partial mobility in my right side could walk with the help of a cane or walker. After returning home my dog needed to go out one morning. When I stepped down I used the wrong leg and it collapsed underneath me and I fell off the cement landing and hit my head on a cinder block. It knocked me out. When I came to, I had gashed my head. I yelled and one son finally heard me and came outside. We live in a rural area so there were no neighbors to see or hear me. He got me back into the house and called 911. He was shaken and I wasn’t able to think clearly. We held a towel to stop the blood until the ambulance arrived and took me to the hosp. Luckily I only needed some stitches and had a concussion and bruised up arm and leg. It was scary and wish we were more prepared. Since, I have gained almost all my mobility back and can walk on my own about 90% of the time. On my way to a New Year’s Eve party many years ago I saw a car in a ditch. I pulled over and my friend went to the driver’s side of the car. The person inside was hurt, and probably in shock. I checked for breathing and bleeding while friend called 911 on her cell phone, this was back in the day when not many people had cell phones. I took a sleeping bag out of the trunk (we arranged to spend the night at the party) and put it on top of the person. When the paramedics arrived they asked us what happened and what we did for assistance. We left when they said we could go, and left our contact information with them. Pretty glad the situation wasn’t any worse, at the time the only supplies I had was some bandages and a bottle of pain reliever in my purse. Now my car kit is a bit more thorough. While in Michigan’s upper peninsula camping, hours away from any hospital, we were sitting by a campfire, kids with flashlights in hand. The kids were having a light saber fight with the smoke from the fire. One swung the flashlight and smacked another in the head, splitting his forehead with the front rim of the mag-light. Blood was gushing down this 4 year old’s forehead and into his eyes. Direct pressure, alcohol prep pad, crazy glue, and a piece of cut fabric gauze as a makeshift steri-strip. The next day when transportation could be facilitated to the hospital, the doctor said, “Where did you have him treated?” The parent replied “at the campsite” the doctor then said “I’m going to leave it, it looks like they did a good job”. Many years ago, my sister had a huge tick dig into her leg. I was in high school but had read instructions somewhere before about how to handle the situation. Knowledge is indeed power.